I have written about Drones and Balloons in the past, mainly to BT/EE. Take for instance this presentation by Mansoor Hanif at TIP Summit and this one on Flying Small Cells. In addition I have also talked about Telefonica's Nano cell, which is a small cell on a drone; Verizon's 'flying cell-site' and AT&T's flying COW. 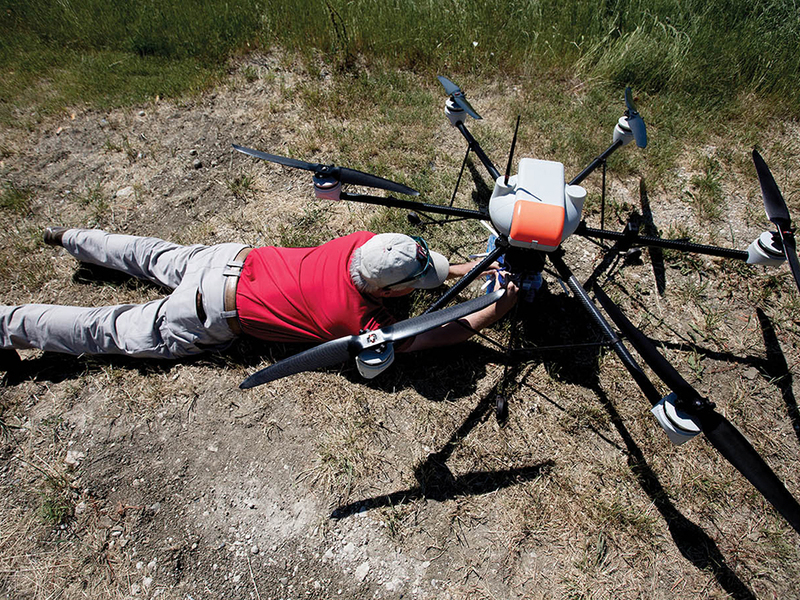 Back in August, IEEE Spectrum ran an article on how Flying Cell Towers Could Aid Search and Rescue. Base stations carried by drones would form an ad hoc network and connect first responders. An aerial communications system supported by drones could be deployed much faster and operate with minimal interference. In 2013, we started to think about what such a drone-based communications system for public safety agencies might look like. We knew it would need a shared radio-frequency channel for first responders, drone-portable base stations, a power supply, and a digital database for exchanging information. We would also need controllers that would be easy enough for a licensed drone pilot to operate in a crisis. Our first major challenge was to find a base station small enough for a drone to support. Drones under 25 kilograms—the limit now imposed by U.S. air-safety regulators—can carry a maximum payload of about 2 kg, so we would need a base station that weighed less, even with its battery. Finally, my search led me to a startup named Virtual Network Communications. This company, based in Chantilly, Va., sells a product called a GreenCell that seemed suitable. It’s a scalable LTE base station, known as a picocell, which is typically used to extend the reach of an existing network but can also generate its own network. The base station contains an E-UTRAN Node B radio with two antennas and a credit-card-size component called a Micro Evolved Packet Core, which uses LTE technology to form an ad hoc network with nearby radios. Then, that local network connects to a nationwide cellular network. With these components, our GreenCell can support communications for up to 128 users at a time from a distance of up to about 2 kilometers on any LTE frequency. Better yet, it measures just 12.5 by 12.5 centimeters and weighs only 2 kg with its battery, just light enough to be lifted by a drone. Once we had found a suitable base station, we still needed to find a suitable drone. Ideally, it would be affordable and be capable of flying for 10 to 12 hours before needing a recharge. Unfortunately, no such drone exists today. Most commercial drones can stay aloft for fewer than 45 minutes. 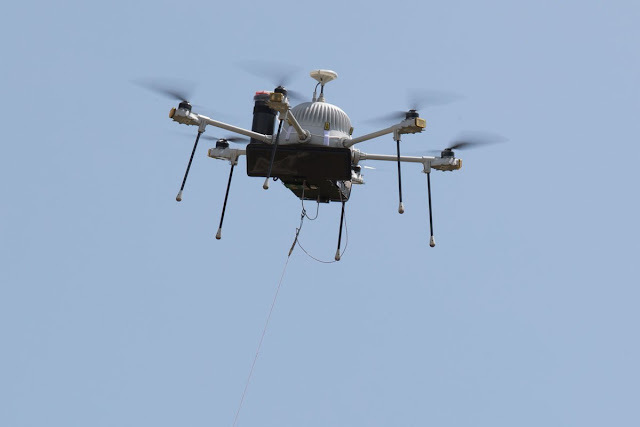 After some research, I found a company named CyPhy Works, which has developed a drone powered through a 150-meter cord that extends up from a grid or generator. Technically, this drone could stay in the air for as long as it had access to a power supply on the ground. But in a disaster scenario, it would have to be tethered to a van loaded with a generator and fuel. That would limit it to serving the same road-accessible places to which mobile units already travel. Another drawback: The drone’s tether restricts its mobility once it’s in the air. We wanted to be able to reconfigure our network in an instant. We briefly considered using balloons instead of drones, but we discovered through trial and error that balloons are difficult to reposition and hold in place, especially during high winds. We decided instead to use the AR200 drone from AirRobot, a company based in Arnsberg, Germany. The AR200 has six rotors that allow it to hover more steadily than the usual four. And because the AirRobot drone is battery powered, it can zoom off to any location. During the field trial, approximately 1,000 flights were performed to collect datasets that were post processed and analyzed. 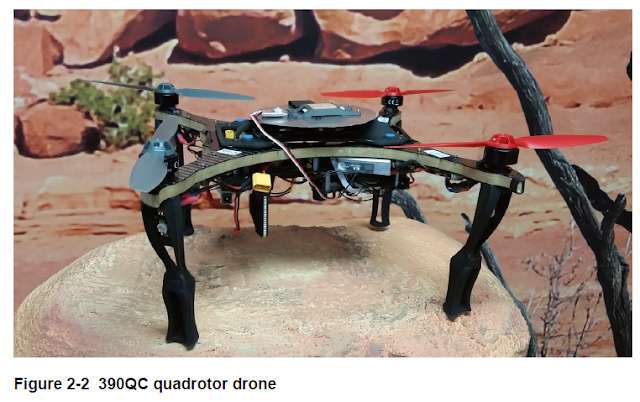 We also performed simulations to complement field trial results by allowing study of performance tradeoffs when the network is serving many mobile devices and LTE-connected drones simultaneously over a wide area. Simulations also enabled rapid testing of parameter and feature changes that are more difficult to study in a commercial network. The field trial demonstrated that LTE networks can support safe drone operation in real-world environments. Our findings showed that existing commercial cellular networks can provide coverage to drones at low altitudes up to 400 feet AGL. Our test drones also showed seamless handovers between different base stations during flights. Below is a glimpse of these findings. The head of AT&T’s Unmanned Aerial Vehicles (UAV) business development team said the operator is working with regulatory authorities and standards organisations to “unlock” the potential of drones. Speaking with Mobile World Live, Greg Belaus said many tests of drones on cellular networks so far have been conducted at a height of 400 feet. In the US, Belaus explained that airspace is governed by the Federal Aviation Administration’s (FAA) Part 107 rules. Belaus said “a lot of work” on drones right now is focused on what needs to be done to open that area for drone services. There is an interesting AT&T Flying COW presentation on Youtube for anyone interested, here. *Full Disclosure: I work for Parallel Wireless as a Senior Director, Strategic Marketing. This blog is maintained in my personal capacity and expresses my own views, not the views of my employer or anyone else. Anyone who knows me well would know this. Providing services to such a prestigious institution is a real privilege but can also be daunting. 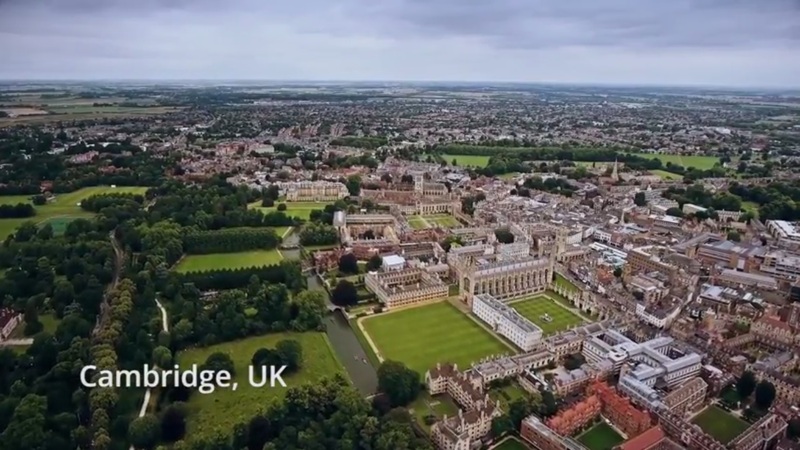 At Cambridge, the whole City is the campus as University Departments and Colleges span the City. Networking on such a distributed scale is a challenge; we have to take both the narrow and wider view at the same time. 25 years ago, the University had the foresight to begin deploying a pan-city fibre optic network, the Granta Backbone Network, to connect the hundreds of University buildings together. Today this encompasses 60 km of multicore fibre over which we run a core and distribution router network. Therefore, as all our buildings are networked together, you would think that deploying Wi-Fi on the back of that must be easy. That could not be further from the truth, as hinted at already, Cambridge is far from simple. The most basic thing you do for a wireless deployment is a Wi-Fi survey. Here at Cambridge, we have a myriad of buildings of all shapes, sizes and types. For example, we have buildings that are eight hundred years old right through to modern structures. The construction of these buildings is amazingly diverse, from metre thick stone walls to concrete monoliths right through to simple buildings made up of modern partition walls. The latter sounds simple until you come across that surprise hefty wall with four layers of unexpected insulation or a signal killing chimney hidden in the wall. We also have constructions as varied as residential buildings, (that can also act as hotels out of term), office blocks, state of the art laboratories, lecture theatres and seminar rooms, libraries and warehouses. This means that the University Wireless Team have their work cut out surveying each of these unique environments while trying to get ubiquitous Wi-Fi into all areas. We estimate that if we surveyed each building end to end, it would take more than five years. You can read the complete post here. Below is a video that shows some of these challenges. Is small-cell thinking changing the face of remote and rural coverage? 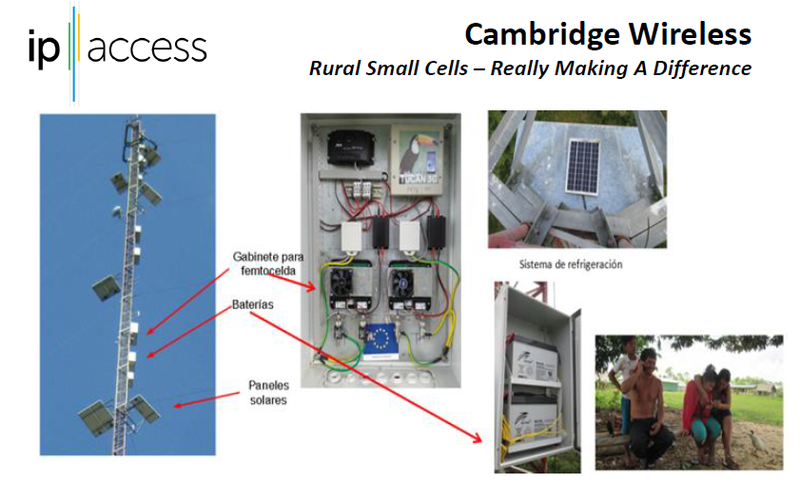 Its been a few months since this Cambridge Wireless (CW) seminar on 'Is small-cell thinking changing the face of remote and rural coverage?'. 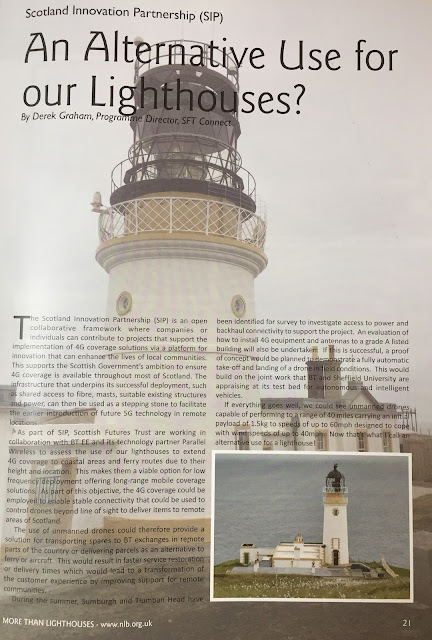 David Chambers (ThinkSmallCell) has written a post summarising the event here but I thought it would be worth bringing this event to people's attention. The presentations from this event are available here. There was a talk on how Nokia Kuha are being installed on Isle of Lewis in Scotland. I have written about them earlier here. For the most remote areas, ip.access gave an extreme example from Peru where it took two days just to reach the site. Again the financial figures look small but can still be profitable. Where a macrocell might serve 1000-2000 users, a remote small cell might serve 100. In this example, a village with 300 people attracted 91 users with an ARPU of $11 generating $12,000 per annum. This was an EU funded research project called TUCAN3G. There are more details about it on the project website. Real Wireless talked about the whitepaper they did for Small Cell Forum. It makes an interesting reading. Finally, Ayan Ghosh from BT talked about Airmasts. I have covered this in detail here. With regards to the IP.Access Peru story where remote users did generate a lot of revenue for the operator, I know the same applies to UK. From my travels looking at rural coverage I have seen that the users in rural community make full use of whatever capacity is made available to them. I posted an interview that I am posting again below. The City and County of Denver (Colorado, USA) is receiving growing numbers of requests from wireless providers and wireless infrastructure companies to construct small cell facilities in the public right of way. As a result Denver Public Works has created a small publication about how they are working with companies to bring small cell infrastructure to the city. Its available here. 9. Can the City limit or standardize Small Cell infrastructure? Considering standardizing pole design elements, color, location, etc. to meet intent and character of existing infrastructure in the public right of way. Limiting pole heights to match existing street lighting and other poles in the public right of way. Generally avoiding placing poles adjacent to parks and historical places. Encouraging pole and equipment designs that enclose as much equipment as possible to minimize visual impact. Co-locating equipment onto existing infrastructure wherever feasible. Installing consistent infrastructure that does not discriminate based on neighborhood type, demographic, or character. Exploring new concepts in combining equipment from multiple companies into specially designed poles. Public Works has placed top priortiy in coodinating design elements for proposed Small Cell infrastructure, and how companies should maximize aesthetics while minimizing congestion of the public right of way. Below are several examples of Small Cell equipment recently constructed in Denver. You can download the document from here. I realised that I never got round to writing a summary post for Small Cells World Summit 2017. In fact I was waiting for summaries for various publications before writing a post but there was much less coverage this year. Having said that, there were reasonable number of operators and most major vendors present. 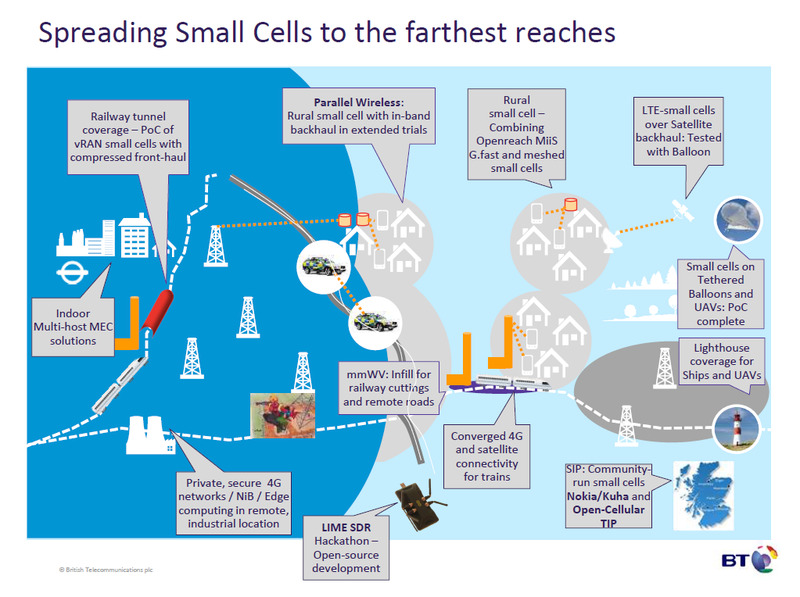 Small cells have sort of gone mainstream from their niche as many operators are now talking of small cells for 5G (mainly higher frequencies). Anyway, here are some links with what I found interesting that you can explore further. SCWS, now in its 9th year, remains a regular feature of the small cell calendar. Now a two day conference, attendance was lower than some years ago but stable with noticeably more system integrators/installers actively participating. There was a little more focus on business enablers rather than technology this year, addressing deployment issues and neutral host opportunities for enterprise, urban and rural sectors. Many mature small cell products are available today for both 3G and LTE. Form factors continue to shrink, software is becoming further automated and refined. The backhaul conference stream has been dropped with CCS now the most prominent independent small cell backhaul vendor. The event provides an excellent opportunity to meet and reconnect with industry players, both old and new. The emphasis and participation has evolved over the years, but it remains a key focal point to assess the current state of play for the industry. The day before the Summit started Nokia assembled a few journalists in a meeting room and gave them a portfolio update. Of note in this was the revelation that the company will be shipping tens of thousands, in fact more than 50 thousand, of its Mini Macro cell sites to Sprint. This is on top of another wide scale roll out of the boxes – which are 2x20W sites in a 5 litre box – in China and Japan where the vendor expects to ship another 40,000. There are 3,000 headed to Brazil, as well, to be deployed as an underlay under Ericsson macro cells. One notable aspect of the event was the amount of talk about using small cells in rural, in dense indoor and in other hard to reach areas. Mansoor Hanif spoke of some of the work BT is looking at to enable it to spread coverage to hard to reach areas. There is a real range of work, best summed up in this picture. Of note is its work with TIP, where it hopes to be able to plug in open base stations as part of its Kuha community-run small cells programme – as per its project on the island of Harris supported by Nokia at the moment. With Lime Microsystems it is delivering a software defined radio base to Open Source, and hopes to attract developers to build applications on top of the Lime SDR platform. Hanif wants to move the cycle for introducing a new feature into a network from months to weeks – but he added that he doesn’t think any operator has the skills to manage that internally – hence the move to Open Source. KDDI’s Fumio Watanabe presented some findings from the operators trials of mobile mmWave systems. The operator’s field trial use 40GHz and 60GHz bands, with a user moving between different bands and being “handed over” between access points. This sort of mobility requires dual interband connectivity and multi-site CoMP to handle the mobility between different sites and bands as a user goes out of line of site of an access point. It may also require some architecture shifts Watanabe said, including the likes of ICN and MEC. Backhaul provider CCS has a couple of things going on. First, it is involved as the backhaul provider to Telefonica O2’s deployment of outdoor WiFi and cellular small cells in the City of London. Steve Greaves, CEO, said that the company will support 450 small cells and 150 WiFi access points by siting its backhaul nodes at 30 Virgin media fibre points – with each backhaul node supporting 3-5 WiFi access points. The backhaul nodes are providing 1.2Gbps capacities at 24/26/28 GHz bands. Greaves is also enthused by an upcoming product launch from CCS, as the company enters the 60GHz band with a 10Gbps product. Greaves says that CCS will go beyond products from the likes of Siklu, by modifying the basic WiGig chip that providers currently use, to add tighter carrier grade SynchE 1588, and greater interference control. The product will not be available until early 2018, he added. Another interesting aspect of the City of London deployment – the concession model between the City of London and Telefonica – means that Telefonica must host other operators’ small cells within the deployment if asked. But these may not be on the same pole as Telefonica’s small cells, given there is a limit of two boxes per pole. From a backhaul perspective – that obviously introduces more complexity – as Telefonica must introduce a V-LAN for each operator, with different QoS. Virgin Media Business, by the way, has 100,000 cabinets in London alone, and wants to use them to act as potential hosts for small cells, by adding a small pole to the cabinet, said its adviser Paul Coffey. The company is also looking at enabling neutral host model using its street infrastructure. Its wholesale business supplying backhaul to the UK’s operators already runs to £150 million per year, Coffey said. Ericsson has launched three new scalable small cell solutions designed to help expand the small cell market and meet the growing demand for better mobile coverage and capacity while preparing networks for 5G and the Internet of Things (IoT) applications: the Multi-Operator Dot and the Multi-Dot Enclosure for indoor deployments; and the Strand-Mount Unit for outdoor micro radios. 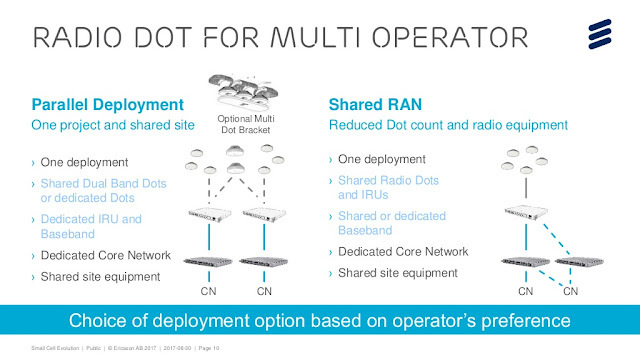 The Multi-Operator Dot solution delivers a set of Radio Dots that can be shared between multiple operators, with one operator managing the system while others provide radio frequency signals – similar to an active distributed antenna system (DAS). This new architecture allows up to four operators to broadcast over a single Dot solution; combining the multi-operator benefits of an active DAS solution with the performance, agility and cost-effective design of the Radio Dot System. As its name suggests, the Multi-Dot Enclosure combines multiple Dots in a single enclosure. The enclosure has a minimal impact on building aesthetics, is useful for multi-operator deployments, and presents a cost-savings option in buildings that charge per box deployed. The Strand-Mount Unit for outdoor micro radios makes it easier to install the radios on the existing grid, hung on aerial coax, fiber, or electricity cables. Aerial-strand deployments are critical for scaling outdoor small cells and can be deployed for both single and multi-operator usage. Ericsson’s new Strand-Mount Unit can support up to four micro radios, enabling multiple operators to utilize the same mount for cost-efficient deployments. The Strand-Mount Unit delivers superior outdoor coverage with zero footprint. 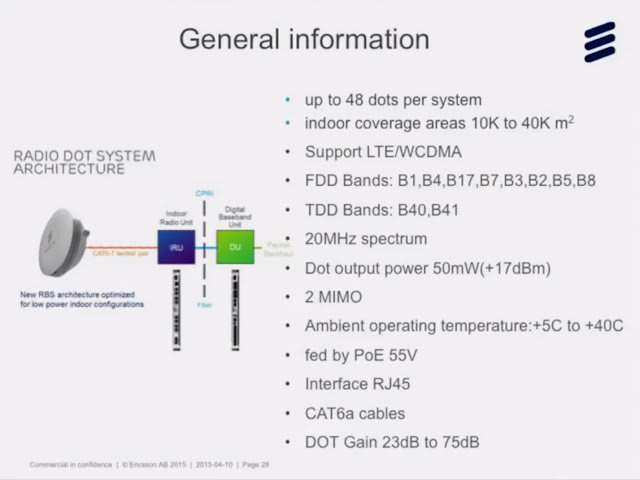 Just in case you were wondering what exactly Ericsson Radio Dot is, the specs can be seen in the picture above. The most significant element of the announcement is the multioperator version of the Radio Dot, according to Ed Gubbins, senior analyst on the Global Telecom Technology & Software team at GlobalData. One of the bigger hurdles to penetrating enterprises (which is what the Radio Dot was designed for) has been that enterprises often have multioperator needs—because enterprise inhabitants typically bring their own personal devices to work and have their own operators. The creation of a multioperator Dot is overdue and gives Ericsson a leg up over rivals like SpiderCloud (now Corning), which have single-operator solutions, Gubbins told FierceWirelessTech. That said, there will still be challenges in penetrating enterprises, even with multioperator solutions. “Getting operators and enterprises to agree on using the same vendor and the same solution on a case-by-case basis isn’t necessarily quick, easy or easily scalable,” he said. 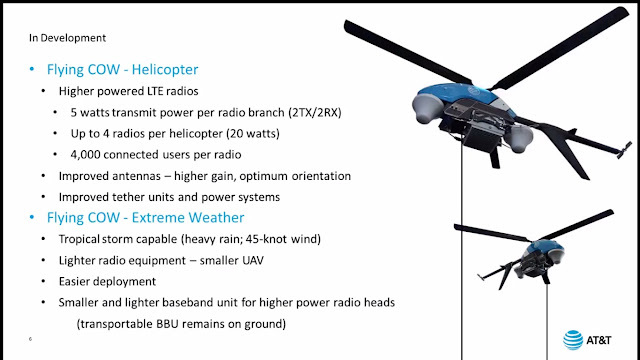 The technologies Ericsson is using to help enable multioperator functionality (MORAN & MOCN) have been around for quite a while, as has the Radio Dot itself. “So the fact that it’s taken years to see a multioperator Radio Dot, despite how long one has been technologically possible to develop, gives some indication that this isn’t perceived as a silver bullet by any means,” he said. However, the fact that Ericsson is presenting more than one model for multioperator deployment is a good thing; operator and enterprise sentiments will vary, so having some flexibility in this area should help, he added. 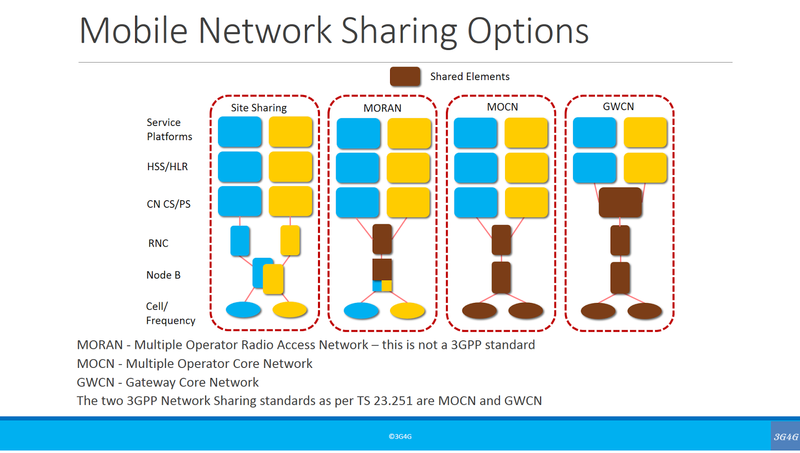 Just in case you were wondering, the different options for Mobile Network Sharing as as shown above. A presentation from Ericsson detailing the new releease and their Small Cells portfolio in general is embedded below. Unlike, say, the Nokia FlexiZone or SpiderCloud E-RAN small cell designs, Radio Dots are not in themselves miniature base stations. Rather they are distributed radio heads attached to a centralised “feeder” baseband unit, mediated through an indoor remote unit (IRU). What Ericsson has announced is the ability to support multi-operator service in three ways. First – parallel deployments with each operator using its own dedicated baseband, IRU and Dots. These Dots can be housed in the same enclosures (the new enclosures known as the multi-dot bracket) to tidy things up a bit. 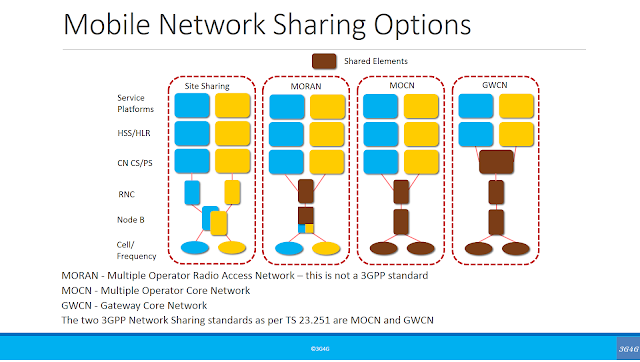 Secondly – a multi-operator deployment using a shared baseband and IRU, over the same network of distributed radio heads, using MORAN (Multi Operator Radio Access Network) or MOCN (Multi Operator Core Network) network sharing capabilities. Thirdly, a multi-operator Dot solution where operators provide multiple RF sources to the same Dot system. They do this by feeding baseband capacity to a new access unit from Ericsson, the RF Access Unit (RAU). This new RAU can support three 2×2 MIMO RF inputs, and can be connected on the other side to four IRUs, which then feed the shared Dot remote radioheads. In both the second and third options, one operator remains in overall control of the deployment. Ericsson’s Dot was initially designed as a single operator system, as was SpiderCloud’s competitive E-RAN. Where once SpiderCloud once made a virtue of its single-operator necessity – stating that an operator would gain competitive advantage by being the “best” carrier within a given office block or campus, it has in the past couple of years taken steps to add multi-operator capability – by adding support for more carriers, LAA and CBRS models. Another small cell vendor, ip.access, has also gone down the multi-operator, or neutral host route. Ip.access’ Viper platform combines multi operator access points with a gateway node that can be deployed as a virtual instance that links to separate operator core networks. Huawei recently expanded band support for its LampSite product – probably the most similar product in terms of architectural design to the Radio Dot – and its aim was specifically to increase support for multi-operator deployments. Although Ericsson claimed at launch that its dual band Dot could enable a multi-operator deployment, it clearly needed to take additional steps to really enable multi-operator models. One approach, as we have seen, is simply to make it a bit easier to deploy two or more instances of everything in the architecture. That seems like a hard model to scale economically, apart from in the biggest sites, perhaps. The other approaches either a) require the implementation of a new element (the RAU) or b) limits the number of multiple operators to two. Ericsson is running a webinar on this topic on 27th September. Details here.